A Treatise on the Progressive Improvement and Present State of the Manufacture of Porcelain and Glass. London: Longman, Rees, Orme, Brown and Green, and John Taylor, 1832. 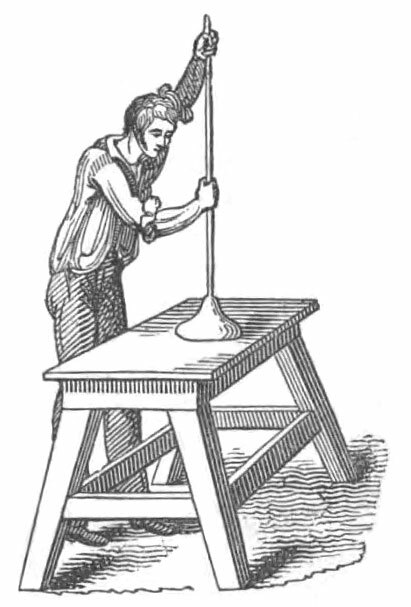 When the materials are properly fused and refined by the removal of all the glass gall, the workman commences his blowing operations in exactly the same manner as has already been described in the process for making flint glass. 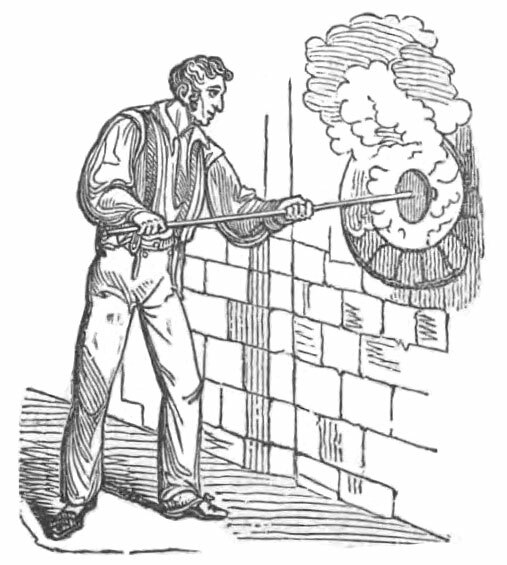 By repeated dippings of the iron tube into the crucible, he gathers as much glass upon its end as experience teaches him will suffice for the formation of a sheet of glass of the usual size, and which generally weighs from ten to eleven pounds. 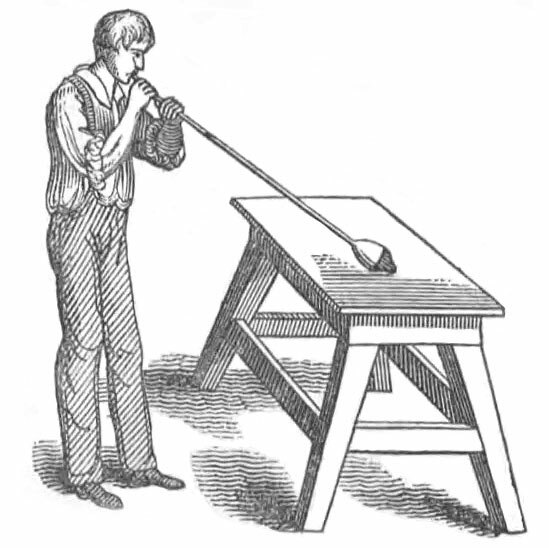 This lump he allows to project beyond the extreme end of the tube; and first rolling it on the iron plane before described, to give the glass a cylindrical form,he commences blowing, when it assumes the shape of a pear. 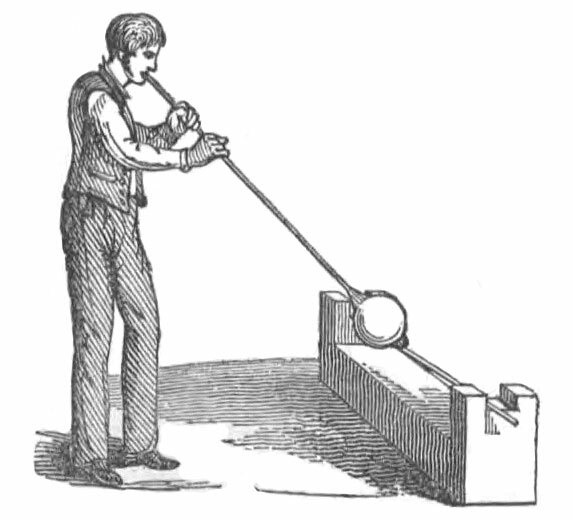 a small portion of melted glass is collected on the end of a punt, and is applied to the centre of this flattened side, forming an union with it exactly opposite to the hollow tube, which is then removed by wetting the glass near to their point of union, leaving a circular hole in the glass about two inches in diameter. 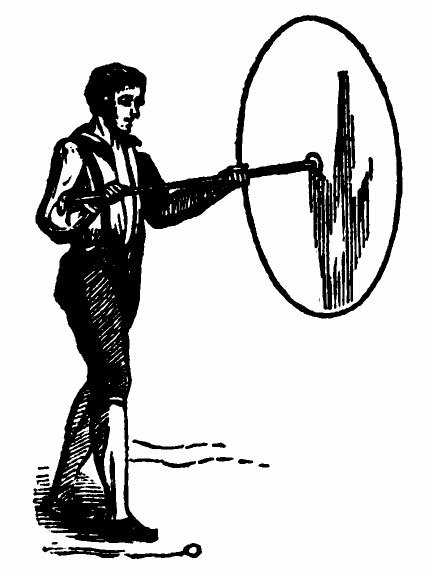 and the glass is converted into a plane disc of fifty to sixty inches diameter, having an uniform thickness throughout the entire plate, with the exception of the spot where it is attached to the iron rod, and where there is a knot or lump which is called a “bull's eye”. Twelve of these plates make up what is called a crate or side of glass. The effect of this operation upon persons who witness it for the first time is both pleasing and surprising in a high degree. The force wherewith the glass flies open at the close of the process would be sufficient, if its brittleness were not removed by heat, to break it into innumerable fragments. The plate, when thus finished, is detached from the iron rod by the usual method, and placed resting on its edge in the annealing oven. 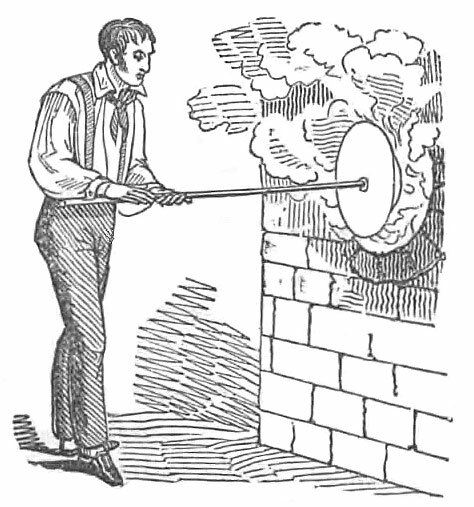 Some considerable care is necessary for regulating the temperature at this stage; for if the heat be too great, the softened glass will bend, and for that reason will be lessened in value, while, if the oven be not sufficiently hot, the plates are very likely to crack; and if even this disaster should not happen, the glass will prove of inferior quality, and so brittle, that the glazier will be unable to cut it with any degree of certainty in the wished-for direction. Crown glass is sold, according to its quality, under four different denominations—firsts, seconds, thirds, and fourths—at considerable difference of price; that of the fourth quality not yielding to the manufacturer nearly one half of the price of the first. These variations arise principally from the want of sufficient care on the part of the attendants, in maintaining the necessary degree of heat in the furnace. If this is once suffered to fall, the property of glass in being a very imperfect conductor of heat renders it difficult again to raise it to the former degree. In the operations of a large glass house it does not often happen that beyond one third of the quantity made is of the first quality; seconds and thirds compose the largest proportion of the produce; and it seldom occurs that the quality sinks below the latter of these two denominations. Large plates of crown glass, such as are required for glazing engraved prints, used formerly to be imported from Germany. This country [England] has, however, for a long time, been not only independent in this respect of all foreign manufacturers, but similar plates of English make are exported to a considerable extent. Last revised: 16 July 2014.